A fellow Miami fly fishing guide had gotten sick and was not able to take Braydon fly fishing in which I was able to help him out. Braydon wanted to sight fish tarpon with a fly rod. This is a very difficult challenge where you try to get the boat positioned in front of some migrating tarpon. Then the angler tries to cast the fly in front of the fish and try to make the tarpon eat the fly. But we were fishing during the beginnings of tropical storm Alberto. It was very windy with very overcast skies mixed with rain. We would not be able to sight fish tarpon, instead we would need to blind cast the fly rod into area’s that were holding tarpon. This technique of fly fishing is referred to as dredging. I like to use an intermediate fly line just enough to sink the fly a little bit below the surface of the water. We get set up at a tarpon spot and on his third cast the fly line comes tight and we are on. The tarpon jumps right away and we both knew that it was huge. The big tarpon took a long run but circled back around right where we hooked it. This tarpon started running us all over Biscayne bay. First trying to get wrapped around a sail boats anchor line, then some lobster trap buoys, then the big tarpon just started going for a bridge. Braydon was putting good pressure on this tarpon, but it was not close to being ready to come along the side of the flats boat. The big tarpon came up and rolled while it was still deep into the fly reels backing and it goes slack, not completely slack, so I put the flats boat in reverse because the tarpon could be just swimming at the boat. But no. Somehow it’s gone and its a long wait to see just what happened as he reels the fly line back on the fly reel. The fly line was cut, not broken! If you look very close, it was cut on a 45 degree angle? The best that I can figure out is that a mackerel or a bluefish must have seen the knot going from the fly line to the leader and decided to bite the fly line like it was a little minnow trying to escape. We kept fly fishing for tarpon but with luck. We then decided to try to fly fish for sharks. 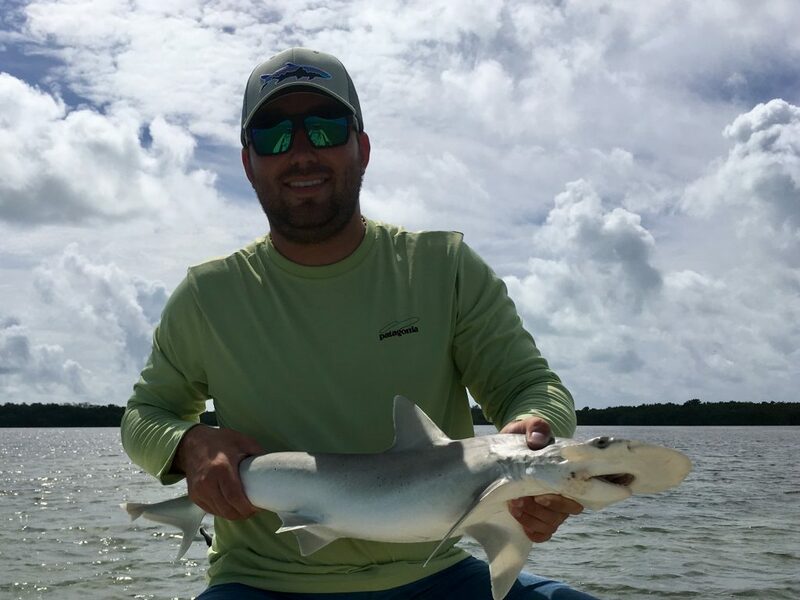 We caught bait for the sharks, they chum very easy and got started trying to chum some sharks into range so we could cast the fly to them. But after trying several spots for sharks we decided to call it a day and try again the next day. 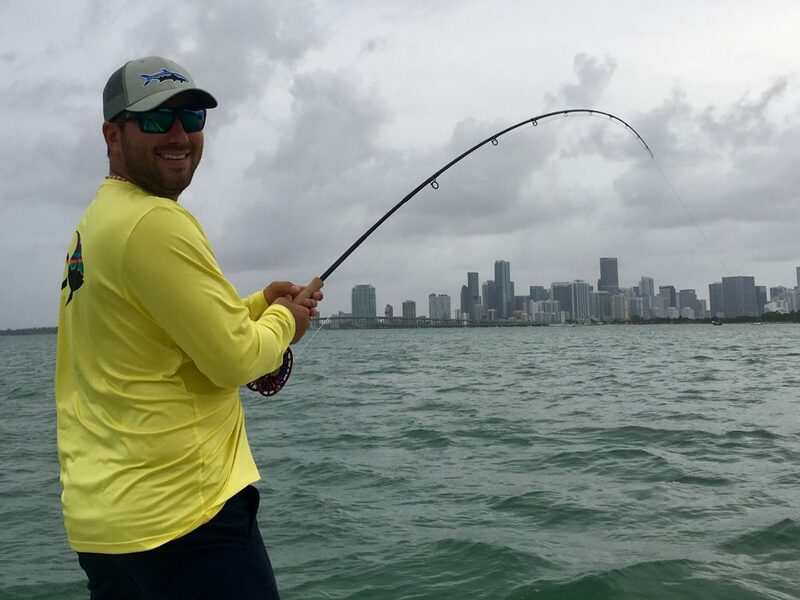 We went straight back to the spot that we hooked the tarpon on fly the day before. And I’m not sure but around the second or third cast a tarpon boils on his fly. I mean a boil the size of a car and it’s looking like we will hook another tarpon on fly again. But no such luck. We fly fished there and several other spots with no action. I wanted to try one more tarpon spot and there were a good number of tarpon rolling around the area. After fly fishing that spot for about 45 minutes we got a bite. I could see the fly line come tight and just as Braydon tried to strip strike the fish, his hand gets caught in the fly reel some how and in a split second the tarpon is gone. We fly fished there for a while with not success and I thought it would be good to try for bone fish. We get to the bone fish spot and got hooked up up right off the bat. 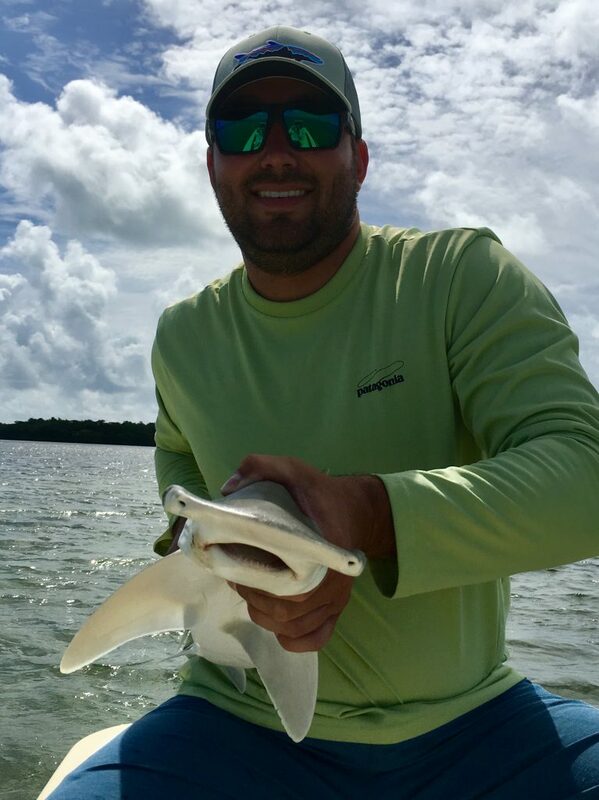 After a long run the fish came back to the boat and it was a bonnet shark but a pretty good sized bonnet shark! We took a couple pictures of it before letting the little shark go. We got back to bone fishing and it was slow. But we stuck with it and I was close to giving up on it when bam, the line goes screaming off Braydon’s reel. This was most certainly a bone fish. After a couple long runs we got to see it. And yes it was a big bonefish around 9 or maybe 10 pounds. He mentioned that he would really like to get a photo with such a big bone fish. All was good the fish is close to the boat and I went to grab the leader. When the worse thing that can happen to a fishing guide happens. Just as I started to lift the bonefish it shook its head and the hook fell out. All I have is the bone fishes tail and this one is far to big to be able to lift out of the water like that, and it’s gone! We did some other fly fishing that day just to get a bend in the fly rod on some smaller fish. But that bone fish slipping away will haunt me for awhile.